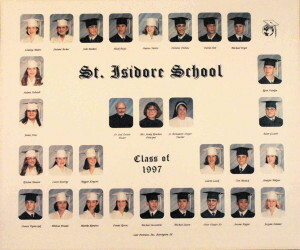 When you think of your days at St. Isidore School, you surely have some fond memories. 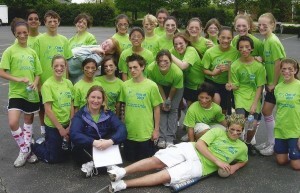 Maybe it was the Jogathon, maybe Sr. Bernadette or another favorite teacher(s), maybe that big game, or play, or musical. How about Wednesday Mass? The Cyclone cheer? Surely, Graduation Day. As many of you as there are out there, are as many memories, for sure. St. Isidore realizes the need to stay in touch with our beloved alumni as much as we are hopeful you want to stay in touch with St. Isidore. That’s why we are out to find you, re-connect with you, cultivate your relationship with your St. Isidore School and eventually, ask your support. Please take a moment to click on the link below for a form we ask you to print, fill out and return promptly so we can keep track of you through the years. And share that news with your friends and classmates through alumni magazines, school web site, Facebook, reunions we are planning and all the many avenues for communications we have available to us. Remember, this is where it all began for you. It was where you first learned. First made some of your life-long friends. First came to appreciate the benefits of a faith-based, Catholic education that, we will venture to say, has helped make you the person you are today. So thanks in advance for helping us get started in a new era of St. Isidore alumni relations. You are a key part of our rich history and heritage. And you will help ensure our future. What did St. Isidore School mean to you?